How It’s New York: Honor Molloy lives and works in New York. She often appears at the salons of the Irish American Writers & Artists. She reads at Barnes and Noble at 86th and Lexington at 7:00 TONIGHT, presented by the New York Foundation of the Arts. How It’s Irish: Honor spent her early childhood in Dublin, and her novel draws on those experiences. This article first appeared in the New York Foundation for the Arts’ website. Honor discusses the creation of the audiobook: you can hear some of it on our podcast! 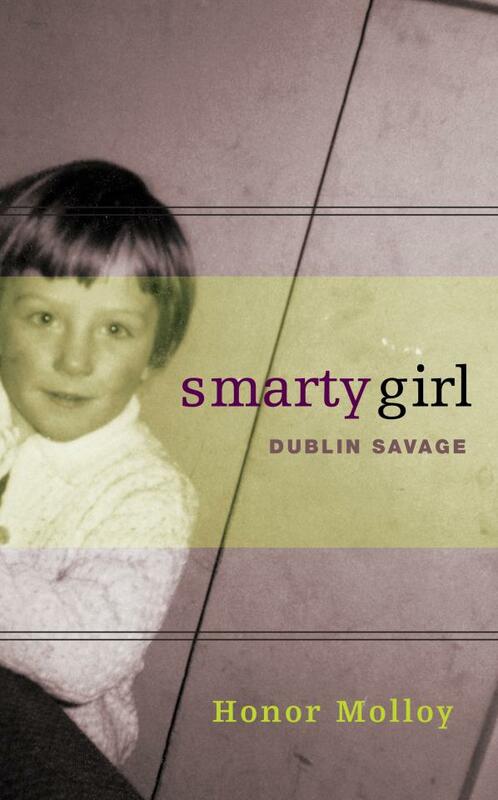 Honor Molloy’s autobiographical novel Smarty Girl – Dublin Savage is an irresistible and raucous portrait of 1960s Dublin, as viewed by Noleen O’Feeney, a precocious little girl with a fierce imagination. Watch a video of Honor reading from the book below and scroll down read NYFA’s interview with the playwright and author. Hi Honor, you’ve been collaborating with Susan McKeown on an eight-hour-long audiobook of your novel Smarty Girl – Dublin Savage, how did you two connect? Susan McKeown and I met in the early 90s when we collaborated on New Georges’ luminous production of Maiden Voyages, a play I wrote with the Irish Midwife Bronagh Murphy that was set on a Dublin maternity ward. Susan sang and portrayed Moira Fury—a ghostly presence. She provided music selections and arrangements of traditional Irish music that added a raw power to the play. Tell us about how it’s been working together. Over the thirteen years it took to write this book, Susan’s music was a constant. Her voice, her lyrics, her interpretation of old Irish ballads and songs played in the room, or in my ears, as I worked. There are musicians in the book and their songs knit the narratives together. So, when I got the opportunity to produce the audiobook, I brought Susan into the process. She composed the music for Goosetown and Dartinne, two original songs written for Smarty Girl. Susan created musical bridges and lullabies and battle cries. It’s everything I ever heard in my head, and more. Did you read any of the audiobook yourself? I read the majority of the book. But I managed to invite a few Dublin pals in to better tell the tale. Susan reads the story of Nuala of the Dagger—the wife to a High King of Ireland who stabs her sons to death rather than surrender them to the enemy. Kevin Holohan carries the heartbreaking section about the death of the O’Feeney family’s beloved uncle. Aedin Moloney takes over the narrative when Noleen gives up on the world and disappears from the book for a while. Moloney gives voice to all the worst secrets—the brutal days before the family leaves for America. This was a welcome break for me, because it is difficult for me to recount those times—even in a fictional form. Also, my mother, Yvonne Voigt Molloy, reads two letters she actually wrote to her sister in 1969. My aunt responded to these letters and gave my mother the help we needed to immigrate to the states. Tell us about the process of making an audiobook, and your role in publishing and creating it. For one glorious decade, I worked at Simon & Schuster Audio. I called it “For-Profit Theatre” because I spent many days processing contracts and payments for actors, producers, directors, abridgers, and sound designers. I used to secretly sit on a couch in the studio—hidden from the view of the reader—and listen in as the likes of Frank McCourt, Nuala O’Faolain, and Laurie Anderson (reading Don DeLillo’s “The Body Artist”) worked in the booth. My former boss—Simon & Shuster Audio Publisher, Chris Lynch—had heard me read segments from Smarty Girl over the years and loves the O’Feeney family. When Gemma Media bought the rights to the book, Chris offered to publish the audio if I produced the program. This was the perfect opportunity for me—because as much as I love the book, Smarty Girl lives in the ear. I’d always wanted control of the audiobook because this is an ensemble piece and Susan’s music is essential. I would have lost this control if it had been produced in the typical manner. My good friend Jan Werner, a freelance audiobook producer who I met when I worked at S;S Audio, came on board as producer for the project. S&S Audio generously provided the use of their studio where we recorded all the readers in four weekends during the holiday season. More recently, I’ve been going down to a music studio on the Lower East Side where we’ve been recording musicians playing banjo, harp, penny whistle, guitar, harmonica. Once we’ve mixed the songs and the music cues, we’ll delicately layer this into the audiobook. Smarty Girl is about your childhood in Dublin, and your work often includes historical characters, how does your work in different mediums—plays, fiction—deal differently or similarly with the past, real events, memory, and/or history? Maiden Voyages, my first full-length play, starts with a woman arriving at a maternity hospital with a dead fetus inside her. She’s been badly beaten by her husband. Many of my plays repeat some version of this scene. It is the climax of my book. In 2002, I received a NYFA Fellowship in Playwriting. My work sample was an eighteen-page segment that concluded with a father beating the mother into a fireplace. My work sample for the 2011 Fellowship was same incident, but told in eighteen-pages of prose. This time, the scene starts with the fight, the mother crawls into the fireplace, loses her child as the father flees into the night. The mother ends up on a maternity ward being tended to by a nurse named Bronagh Malone. And it’s back to the characters from Maiden Voyages. You see, it’s all one big story for me. Clamoring to be told. I’m hoping this is it for me because I want to move on to lighter subjects. Where do you like to write? If you have a dedicated workspace, what is it like? For the past seven years, I have been writing at the Brooklyn Writers Space on Garfield Place. This is my little bit of heaven. Brick-red walls in a room filled with twenty-or-so carrels, windows at my back, and a skylight above my preferred desk. Because I have a demanding day job, my work is restricted to weekends. I am so conditioned to work well in this haven, that as soon as I hit the desk and power up, I’m typing away. How do you see your social and/or political role as a writer? Is it different as a playwright vs. as a novelist? I have always written about women and power and I suppose that could be viewed as being political. I can’t shut up. I won’t shut up. My plays are filled with smart, funny, determined women. Mouthy women. Compelling women. My world is peopled with these women. I started writing Smarty Girl because I couldn’t find a place for the women I wrote onstage. I’m hoping that the audiobook will find its rightful audience. We’ll see . . .
What arts organizations, opportunities for playwrights and novelists, residencies, etc have you found most helpful to you? New Dramatists provided an artistic home for seven delicious years. I developed this story in both prose and dramatic form while I was in residence. My Fellowship year at the Radcliffe Institute for Advanced Study at Harvard granted the time and space to transcribe hours of tape recordings and compose critical segments of the book. Then there’s the residencies at Hedgebrook, MacDowell and Yaddo where I wrote additional chapters and ate dinner with a bunch of wonderful artists practicing in various disciplines. Receiving a second NYFA Fellowship for the same scene underscores the power of this story and its need to be told, no matter the form. I look forward to my Artists and Audience Exchange at the Brooklyn Public Library on March 18th. I’m sharing the stage with Kevin Holohan, fellow reader on the audiobook and author of The Brothers’ Lot. A great portion of the audiobook’s budget was paid for by my NYFA Fellowship. It provided the artists’ fees for the readers and musicians, as well as a substantial portion of the engineering costs. If I hadn’t received this Fellowship, I would not have been able to produce this work. Honor Molloy holds an MFA from Brown University and has received fellowships from the NEA, NYFA and the Radcliffe Institute for Advanced Study at Harvard as well as a Pew Fellowship in the Arts. Born in Dublin, she lives in Brooklyn.